In 1939, as global powers vied for ascendency, the wife of Cecil Collins made a drawing of a Fool. An artist in her own right and a muse to her husband, with this image Elisabeth (née Ramsden) drew Collins into engagement with an iconographic tradition that reaches far back into medieval Christianity. For centuries morosophia, the path of foolish wisdom, has been represented by the figure of the Holy Fool – one who refuses to succumb to the weight of the world, choosing instead to engage as a child who marvels and delights. Collins realized that “what he most valued in himself was his childlike heart,” and that the “true purpose of his keen analytical mind” was to not to betray that heart. Thus the Fool became one of his most recurrent images. Early in a series titled The Holy Fools, Collins painted The Sleeping Fool. It affirms the presence of the attending, waiting Muse – both figures with eyes closed in contented reverie. Illustrating such poetic life in The Joy of the Fool, Collins’ familiar figure appears as ifin jubilant dance. At his side hearts hang exposed – how foolish! – on the Tree of Life. Light emanates from the tree, energizing the figure with his own jangling bough. Collins feared that only when humans became “empty and desolate, so remote from the sap of life,” would they be ready to say “Veni Sancte Spiritus/Come Holy Spirit.” The Joy of the Fool invokes the Awakened to dance now, uninhibited around the Tree of Life. Not in the accumulation of knowledge, not in careers or cleverness, such is the uncomfortable foolishness of Christ. And Collins was explicit: the greatest Fool in history was Christ. A Fool crucified by respectability, by commerce, by official culture ... by the Church – by those frightened and disturbed by what this Fool called followers not to do. Collins wondered if too much theologizing on the Cross had overshadowed the active joy of the Resurrection – that holiest of dances, which trumps a tree of death with Life. In the striking piece Resurrection, Christ’s face is clearly that of Collins’ Fool. Collins hoped that such holy folly would remind his audience that too often convention is our nemesis and cynicism our god. That too often we arm ourselves with knowledge, influence and sensibleness. The Joy of the Fool suggests that one of the greatest privileges and delights of the artist – especially the artist who believes in a risen Christ – is that of awakening others with the childlike call: Come, be a Fool as well. 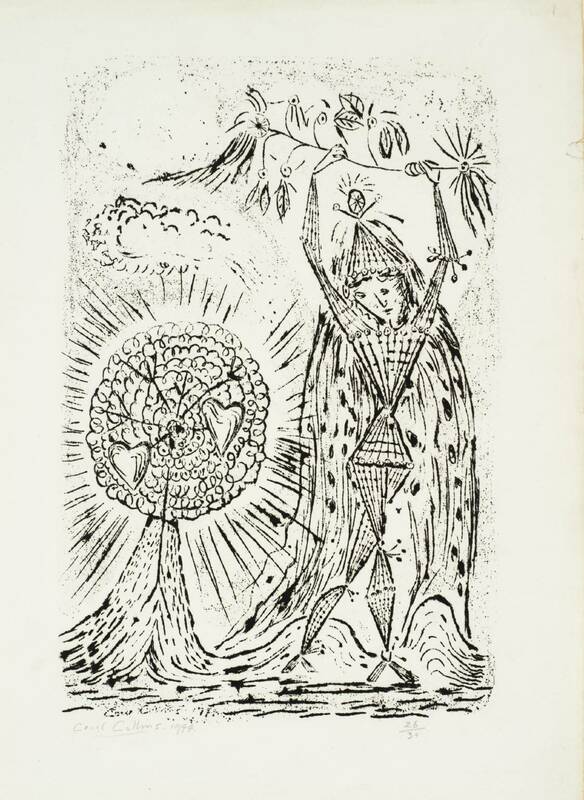 Cecil Collins: The Joy of the Fool, 1944, medium roneo print on paper. 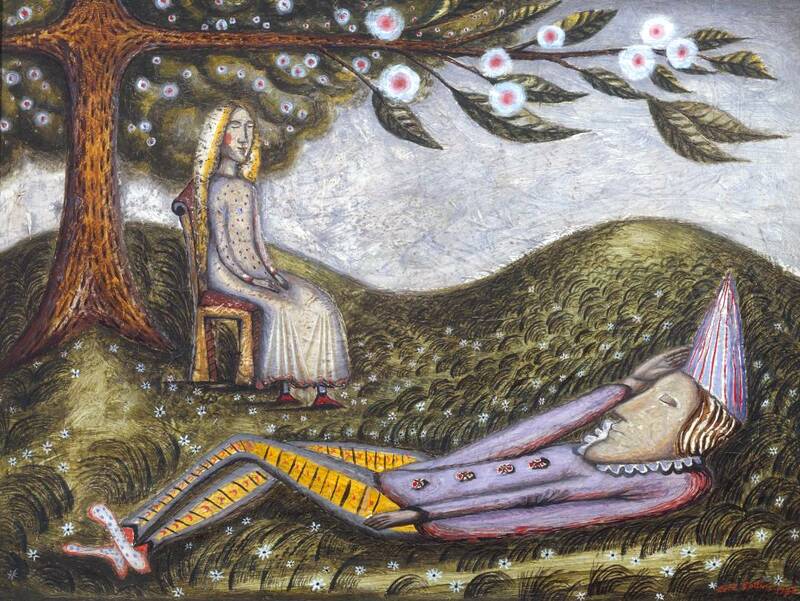 Cecil Collins: The Sleeping Fool, 1943, oil on canvas. 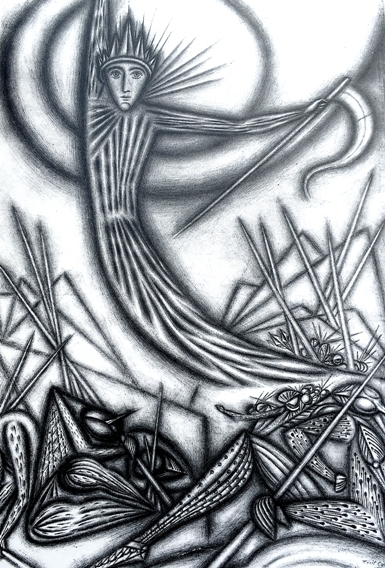 Cecil Collins: Resurrection, 1952, pencil on paper. Cecil Collins, MBE (1908 – 1989) was born in Plymouth, UK to Cornish parents. Collins began his adulthood as a mining engineer at the age of 15, but soon escaped to art school with the aid of scholarships. He met his wife Elisabeth, a fellow artist who appears in many of his paintings, at the Royal College of Art. Atypical in 1930’s London, Collins scorned the concept of ‘art for art’s sake’, asserting that art is a metaphysical experience which must engage with the whole of human nature. Although his early years were influenced by Surrealism, he later distanced himself, claiming: “I do not believe in surrealism, precisely because I do believe in surreality, universal and eternal above and beyond the world of intellect and senses, but not beyond the reach of humility and the hunger of the human heart.” Collins had a particular gift for teaching and his unusual pedagogy attracted many devoted students. A painter, illustrator, tapestry and stained glass designer, Collins remained artistically isolated for most of his life, abjuring ‘movements’; his greatest recognition came after his death. Both his writings and his archetypal figures – the Fool, the Angel and the Sybil – evoke a 20th-century Blake, shaped by a Neo-Platonic Christianity. * The Vision of the Fool & Other Writings, Cecil Collins, Golgonooza Press, 2002. Kirstin Jeffrey Johnson completed her doctorate on the mythopoeic art of George MacDonald at the Institute for Theology, Imagination and the Arts, University of St. Andrews, Scotland. A free-lance writer and lecturer, she lives on a farm in the Ottawa Valley, Canada. Seewww.kirstinjeffreyjohnson.com.